The African Nations Cup starts today with the opening match between Equatorial Guinea and Congo. The tournament was originally scheduled to be in Morocco but the hosts withdrew possibly due to fears that the impact of concerns about Ebola might have on their tourist industry. The opening match of the tournament shows that these fears are unlikely to cause problems. It is hard to know exactly what corresponds to a fear of disease coming from abroad but Mars conjunct Neptune in Pisces on the 9th house cusp does seem to reflect it quite nicely. The ruler of the chart, the Moon however is in trine aspect to Jupiter so its not likely that these fears will be realised. Its a relatively straightforward chart although Uranus and Pluto are angular so there could be a few surprises. 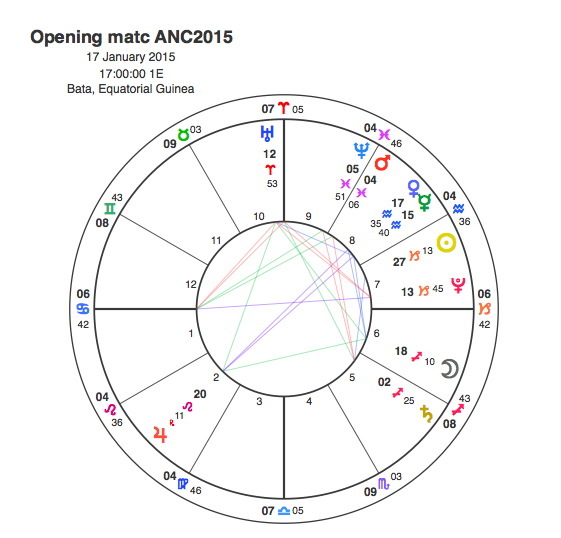 In as much as the opening chart relates to the first game you would think the Moon Jupiter trine would have Equatorial Guinea seeing off Congo fairly easily. Its hard to see Eq Guinea going very far in the tournament though as manager Esteban Becker has Neptune approaching opposition to his Sun. For the rest of Group A its fairly safely assume it won’t happen for Burkino Faso as manager Paul Put has Neptune square his Sun and Saturn applying to oppose it. In fact you would think that his appointment won’t last long after an ignominious exit. Gabon manager Jorge Costa is famous for two things, being the Porto captain of the side that won the Champions League under Jose Mourinho in 2004, and being the defensive mainstay of Capricorn Research’s Arsenal team that won the Championship Manager equivalent. Costa has Jupiter opposite his Mars in the early part of the tournament which should create a bit of excitement and may well propel them through the group stage. Congo manager Claude Le Roy has Saturn square his Mars so can’t see much luck going his way. For Group B, I can’t find the birth details for Zambian coach Honour Janza or DR Congo’s Jean Ibenge and frankly if a country can’t be bothered to provide such a simple thing they obviously aren’t taking the tournament seriously enough. There’s nothing much going on for Tunisia’s Georges Leekens and Cape Verde’s Jose Aguas. Cape Verde’s defender Fernando Varela has Saturn conjunct his Sun which seems fairly appropriate as the tiny islands will no doubt be under siege most of the time. Its a FIFA rule that all tournaments have to contain a Group of Death and without doubt 2015 African one is group C. First up is frequent World Cup high achievers Ghana, these days managed by the much travelled Avram Grant. There is no news on whether he got the job by being mates with the country’s president and being firstly taken on as technical advisor, only for the actual manager to be sacked under controversial circumstances, with Grant the only person left to do it. Grant has Jupiter opposing his Sun for the final stages of the tournament. He also has Pluto and Uranus heading towards his Mars over the next few months so 2015 could be a major year of change for him. So this could be a successful tournament for Ghana. If so expect hitherto uncapped striker Kwesi Appiah to do well as Jupiter is conjunct his Sun and square his Mars. On the other hand, Jupiter on the Sun for a Cambridge United striker would just be getting into the squad itself. Ghana captain Asamoah Gyan has his Sun closely conjunct Saturn in Sagittarius. This is a very fitting placing for someone who is captain of his country with 86 caps and considered to have godlike status at home but who’s fame outside of Ghana is chiefly for showing Luis Suarez that dastardly deeds do pay on the football pitch by blazing that World Cup penalty wide and running away from Sunderland to play in the Middle East for reasons that obviously had nothing to do with money. When anyone has such a close Sun / Saturn at birth they would not be looking forward to their Saturn Return. Gyan’s has just recently occurred and has forced him to deny media rumours linking him to the alleged ritual sacrifice of his friend, rapper Castro. Asamoah must be hoping that 3 degrees is enough distance for Saturn to allow him to put these problems behind him and resuscitate his reputation with a captain’s performance in Guinea. Unfortunately things don’t work out as simply as that. Retrograde motion means that Saturn will return to his Sun in June and again September this year. Algeria are among the favourites for the tournament and manager Christian Gourcuff has Uranus conjunct and Pluto square his Sun. This would be good enough for Capricorn Research. If they do it will probably be in spite the efforts of Tottenham’s Nabil Bentaleb and Dinamo Zagreb’s El Arbi Soudani, both of whom have Saturn conjunct their Sun. Expect much moaning from Mauricio Pochettino and his Dinamo equivalent when they come back from the tournament injured. The same may well apply to Leicester’s Riyad Mahrez who must have been hoping for a month’s escape from relegation troubles. Unfortunately Saturn squaring your Sun means that you take it all with you. Most English punters believe that the African Nations will be won by the team containing the largest number of names that they recognise. This is very rarely the case and Algeria will no doubt be relieved by not having to include a posse of elderly Premier League stars already knackered from not having a Xmas break, so for once it looks like the tournament favourites might well win it. If the tournament were held in March, however it would be tempting to go for South Africa as manager Ephraim Mashaba would have Jupiter conjunct his Sun then. After the disappointments of the last few years, South Africa are on a roll since Mashaba’s appointment last summer, as any Sun sign astrologer would expect since Jupiter has been in Leo since all that time. South Africa is chiefly a squad of home based players but its likely that they will make a decent fist of this group of death. The same could well be said for Senegal as manager Alain Giresse is another Leo. Giresse was famous for his performances in the legendary French midfield that won the European Championship in 1984 with Michel Platini and Jean Tigana and Luis Fernandez. The famous ” magic square ” have had mixed fortunes in management however. Tigana performed great feats with Fulham until Mohammed Al Fayed replaced him with Kevin Keegan, and Fernandez was responsible for bringing Ronaldinho to Europe, but Platini has been a complete waste of space since retiring from the game. Giresse is another Leo but with the Sun at 10 degrees of the sign is not eligible for another visit from Jupiter. The big planet is square his Mars however suggesting Senegal will make a fight of it. Group D contains Ivory Coast, and everyone assumes they will win it because they know some of their players. Yaya Toure has past his worst period now, Saturn’s opposition to his Sun and Mars corresponding with the birthday cake saga and a run of poor form together with the tragic loss of his brother. When or if he will get back to his previous couple of seasons best form is unknown as a lack of birth time means Saturn could still be opposite his Moon. Man City’s other big player, new boy Wilfried Bony has nothing much to speak of at the moment so a month in Africa might prove to be a good time for a rest before working out how he is going to make it onto the City bench. Didier Drogba has retired but Kolo Toure is still there. He has nothing much happening at the moment and its unlikely that Liverpool would be too upset at losing him for a month. Gervinho, by all accounts has been playing well since his blessed release from Arsenal and his resurrection in the holy city at Roma. This might well fit with the symbolism as the spiritual Neptune has been square to his Sun and probably Moon as well. It’s not wise for footballers to depend on Neptune transits however as things suddenly become not as clear as they thought they were. This is particularly the case with Saturn coming to oppose his Sun. In fact this tournament or the next few months could prove to be a disaster for Gervinho. Arsenal fans would be saying they told us so. Cheick Tiote has nothing much going on. Salomon Kalou has Jupiter conjunct his Sun but this tournament comes either a few months too late or too early for him to be really at the peak of this transit. But the main problem for the Ivory Coast is that manager Herve Renard has Neptune and Saturn aspecting his Mars, so it doesn’t matter how many big name stars turn out, their name is not on the trophy. Mali manager Henryk Kasperczak has Saturn somewhere around his Moon so they are unlikely to go far. Cameroon manager Volker Finke has Jupiter conjunct his Mars and square his Venus during the tournament. This is definitely a good sign and they should do well. Its probably not enough to win though because Finke has a natal Mars / Saturn / Pluto formation. Guinea coach Michel Dussuyer has Neptune square his Sun so its unlikely we’ll see much from them. Capricorn Research is keen on the favourites Algeria but if Avram Grant’s Jupiter swansong sees Ghana propelled all the way to the final by an unknown Cambridge striker’s goals only to lose on penalties as Asamoah Gyan recreates John Terry’s famous Moscow ” slip “, just remember that you heard it here first. « Can Brooklyn Bend It Like A Beckham ?